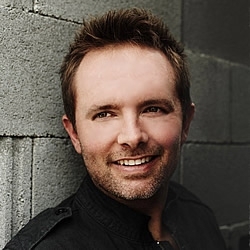 Christopher Dwayne Tomlin born May 4, 1972 is an American contemporary Christian music (CCM) artist, worship leader, and songwriter from Grand Saline, Texas, United States who has sold nearly 30 million records. He is a former staff member at Austin Stone Community Church and is signed to EMI's sixstepsrecords. Tomlin leads worship at many Passion events. Some of his most well-known songs are "How Great Is Our God", "Jesus Messiah", "Amazing Grace (My Chains Are Gone)", and "Our God", which he co-wrote with Matt Redman, Jesse Reeves, and Jonas Myrin. He is currently a worship leader at Passion City Church in Atlanta, Georgia, with Louie Giglio, Kristian Stanfill, Christy Nockels, and Brett Younker.